This update took forever, and considering there weren’t many screen shots for it, there should be no excuse. Except contests are stupid when there’s like three viewers. Further updates should now roll faster (assuming I learn how to edit videos faster). Anyhow, let’s continue this thing. We wandered around the cave for a bit, our combined senses of direction were all off. Perhaps it was just something about caves. At one point, we were wading through the water. I paused in front of a waterfall, something was there. “Wait here, you two, I have a feeling about this.” Tellah nodded. Rydia protested. “But! Cecil! I wanna go too!” I kneeled in front of her. 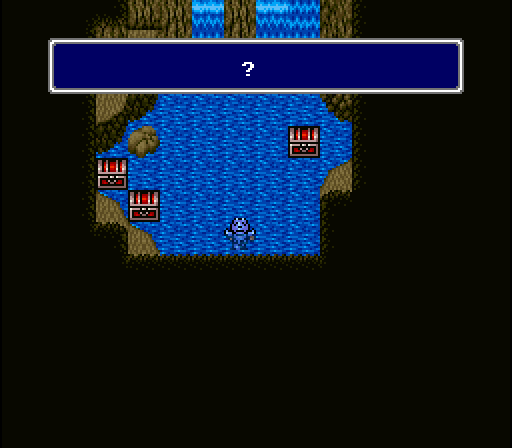 “You can’t, Rydia. Who knows what may be behind there. I can’t allow you, or Sage Tellah to face danger, or even death because of a silly sense I have. I shall check it out myself. That way, if it is dangerous, you two will know. There’s no need to lose all of us.” She seemed to understand, although she was disheartened. I proceeded forward into the water. Stepping behind the falls, a small cave opened itself to me. Another cave. It’s always caves. Treasure presented itself to me, there were all items we could use. It’s going to help us, it’s not stealing. I emerged from the waterfall cave. Rydia lit up, Tellah simply nodded. “What did you find, Cecil! I bet it’s something cool like a secret pirate place!” Tellah looked at her, wanting to roll his eyes; I noticed that and shot him a glance that basically said ‘She’s still a kid.’ “No, Rydia. It was just a small cave. There were a few items there that we could use.” Tellah spoke. “Alright, enough of this. We have a mission, we must press forward.” I nodded. We found the rest of our way in silence. Until we came upon a spot where monsters cannot invade. 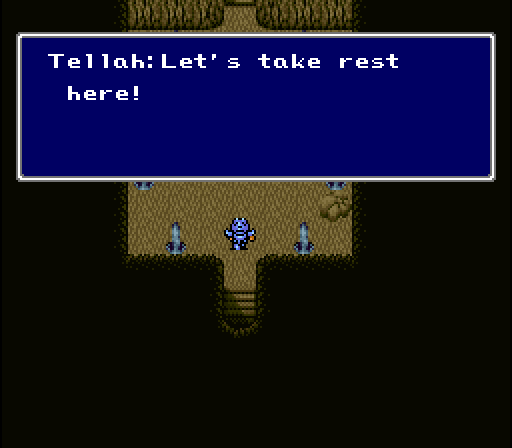 “Let’s stop here for a little bit.” I agreed, we must have spent most of the day inside of the cave, it has to be late. “As you probably know from your adventures, these pillars create a special field that will ward off monsters. We’re completely safe here.” I nodded, of course I knew. “Let us rest then, and prepare for our upcoming battle.” Rydia fell fast asleep, it must have been getting late. “You said she was a caller of Mist, did you not?” I nodded. “She seems to understand the powers of magic quite well. If she studies properly, she can wield other magic besides summing magical creatures.” I nodded once again, it would be a good idea to have a large arsenal of magic spells at our disposal. “She reminds me of my daughter, Anna. My only daughter. The bard I told you of, he did not kidnap her. She willingly ran away with him, because I did not consent to their marriage.” That really isn’t a valid reason to go and raise hell, old man. “And you, why are you going to Damcyan?” “Oh. Uh. A…friend of me is suffering from a horrible fever in Kaipo. I need to find the item to cure it.” “The SandRuby. So, you too are in a hurry. We must depart first thing in the morning, then.” “I agree, Tellah. 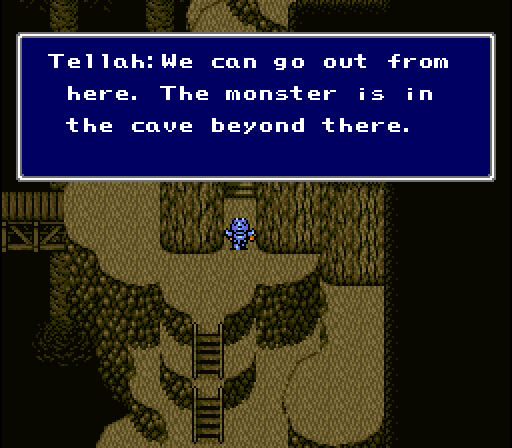 But first, I must know about the monster guarding the exit of this cavern.” He had mentioned earlier that my Dark Blade maybe able to defeat the monster. “Oh, yes. 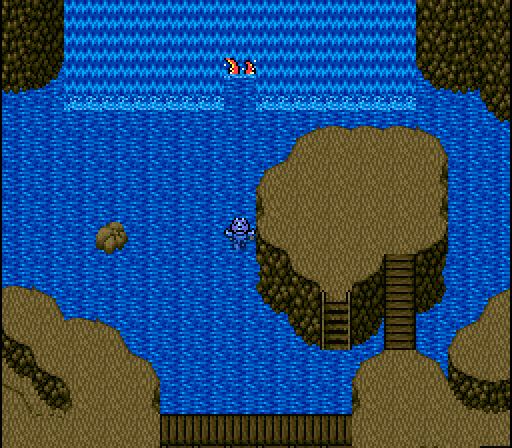 It’s a huge beast that lives in the water. It has eight huge tentacles, and it like to use them to catch would-be adventures, quickly ending their life.” I suddered, we had better be able to defeat this thing. “Also, Dark Knight, we MUST defeat it before we can reach Damcyan.” Why did he have to add that part? The morning quickly came, and we departed. Great. I thought. This had better work, old man. “Alright, we’ll press forward, you two, but we must be weary of the cave’s guardian. 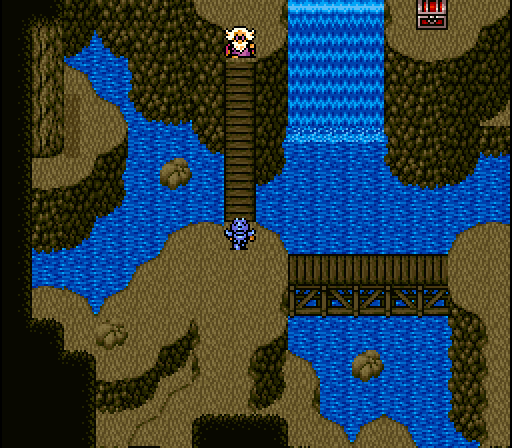 We must defeat it in order to exit the cave.” Rydia and Tellah both understood. We headed up the stairs, only to find it was an exit to a small valley in the mountains. There was only one way out, the cave to the north. We all headed towards it, we knew what was awaiting us. I could see it. First one tentacle, then another, and then another. “C-c-c-cecil! I’m scared!” I couldn’t show that I was nervous in front of both Rydia and Tellah. Looking forward, I spoke. “It’ll be alright, Rydia. Remember what your mother told you about thunder?” “Y-y-y-y-yes.” “That’s good, Rydia. Just keep remembering that. Close your eyes if you have to.” I paused. “We’ll be fine with Sage Tellah here, too. I know that he can cast a lightning spell, too. Right, Tellah?” “That’s right! Just keep casting your lightning spell, and we’ll be right through this!” He make it sound easier than it will be. We’d have to take out each of the arms before we could get to the beast’s head. Everything should be alright, as long as we focused on the same target.. Previous: Chapter 2, Part 1. Next: Chapter 2, Part 3.